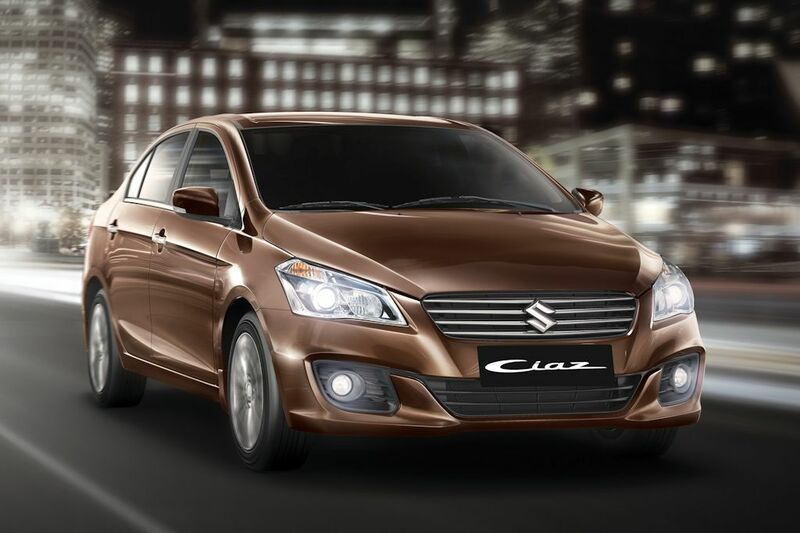 UPDATE 1: The Ciaz is now available at all Suzuki dealerships nationwide (4/16). 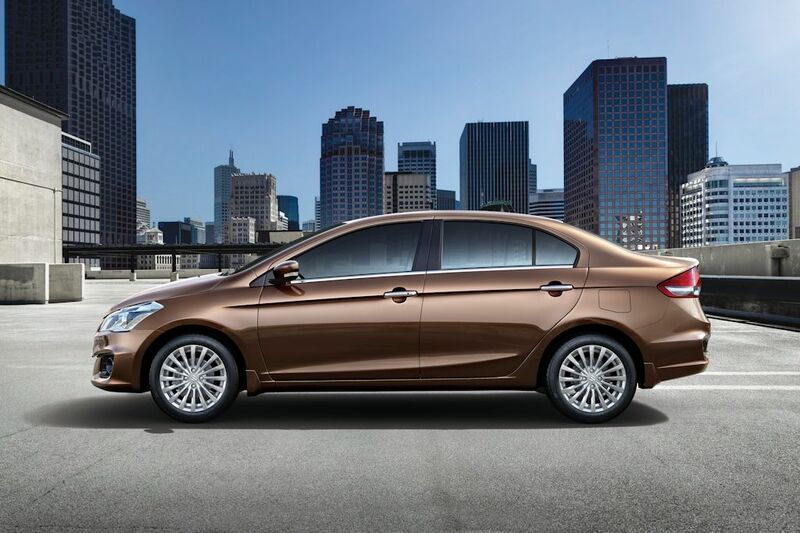 Suzuki Philippines is entering the sub-compact sedan segment once more with the all-new Ciaz. 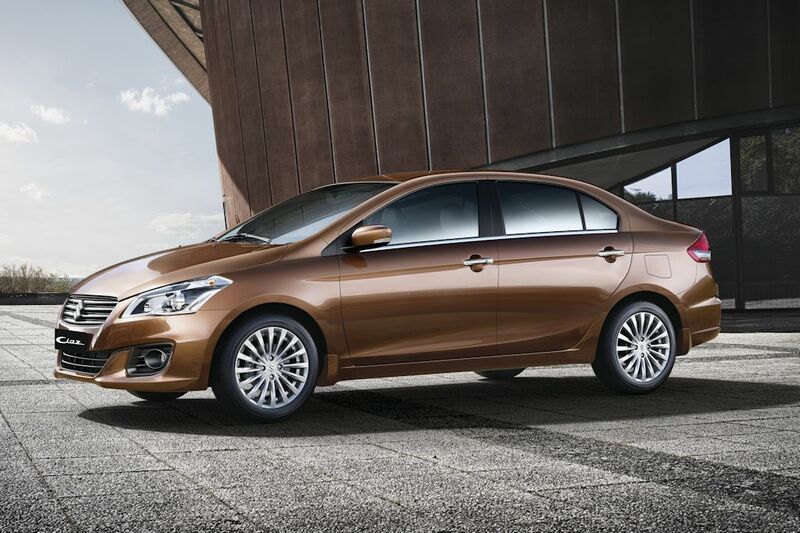 Replacing the SX4 Sedan, the Ciaz is built on a platform that’s the longest and widest in its class. 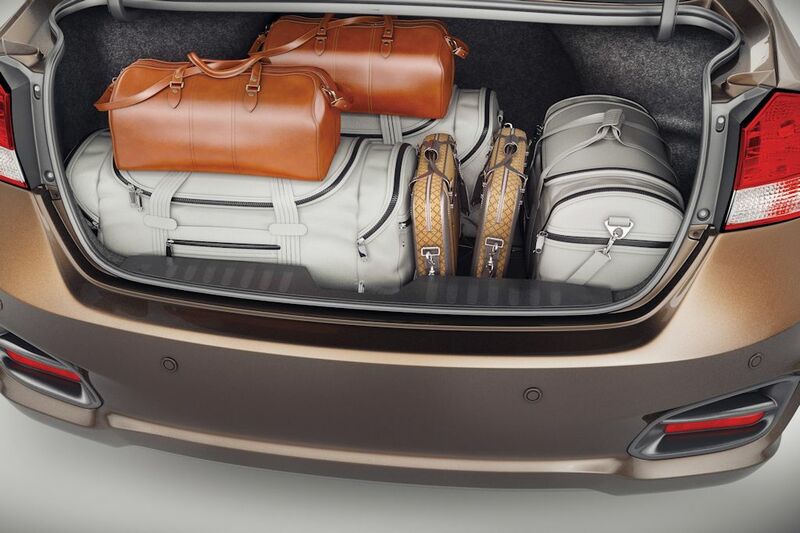 Apart from sheer size it offers European-inspired styling, a premium interior, and a host of upmarket features. An acronym which stands for “Comfort-Intelligence-Attitude-Zeal”, the Ciaz will be sold in three variants starting this April. 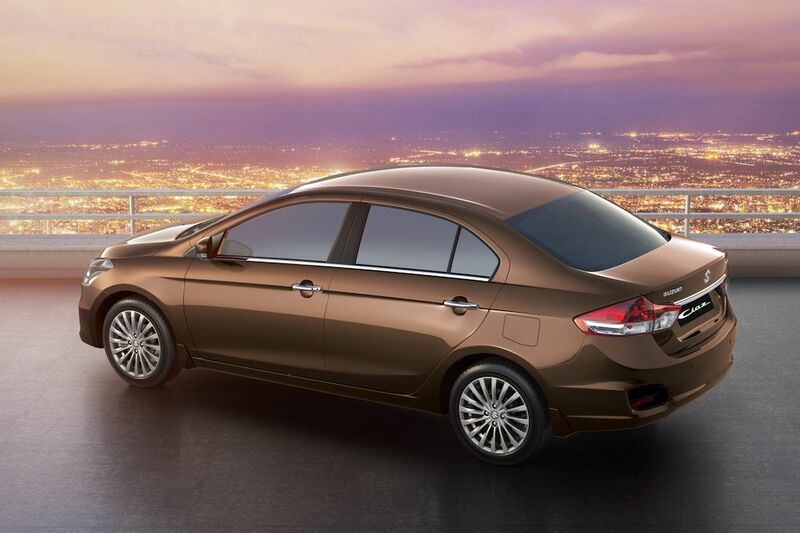 Borrowing cues from European cars, the Ciaz has a timeless and clutter-free exterior. Straight lines as well as a strong shoulder line impart a classy look while projector-type headlamps offer a tinge of sophistication. The signature Suzuki “S” logo is front and center on the wide grille while chrome garnishes on the door handles and trunk as well as integrated signal indicators on the mirrors lend finesse. 15-inch alloy wheels are standard with the highest trim getting 16-inch alloy wheels. 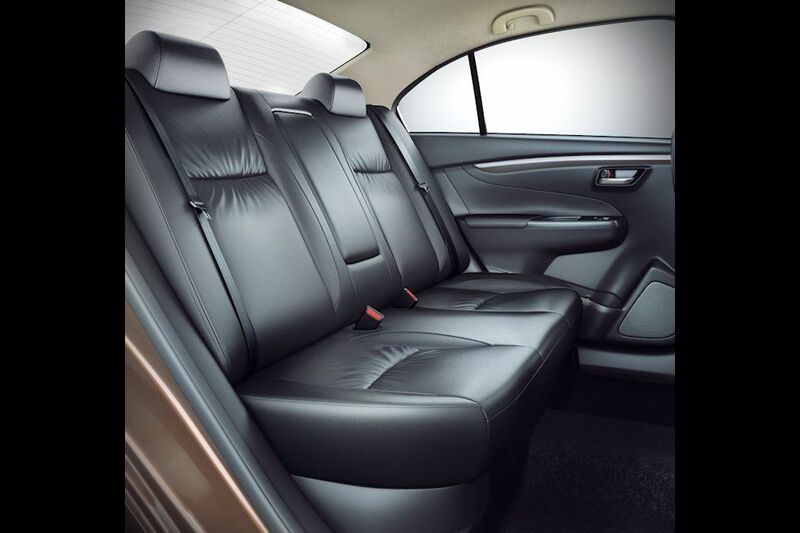 Inside, the Ciaz provides enhanced leg, head, and shoulder room for all occupants. 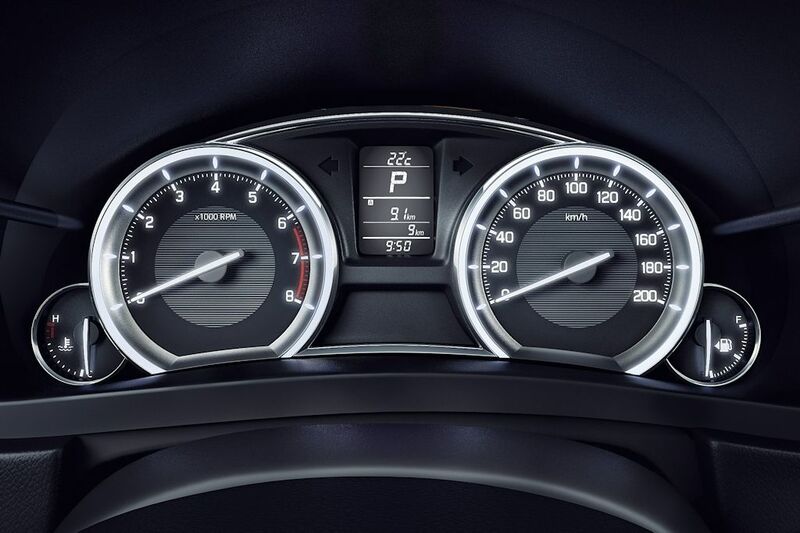 The driver’s seat in particular enables it to have best-in-class front and rear visibility. 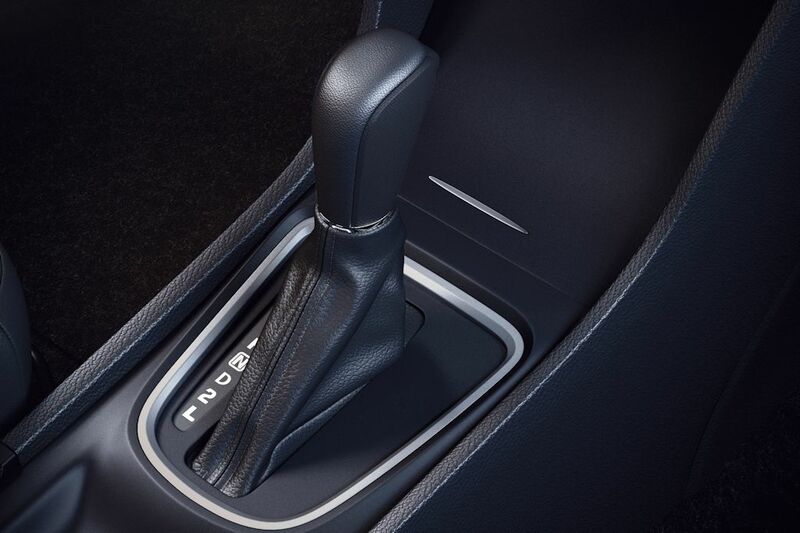 The all-black interior provides an air of sportiness and is available with convenience features such as a keyless push start system, leather seats, and even an Android OS-based multimedia system with mirror-link capability and GPS navigation. 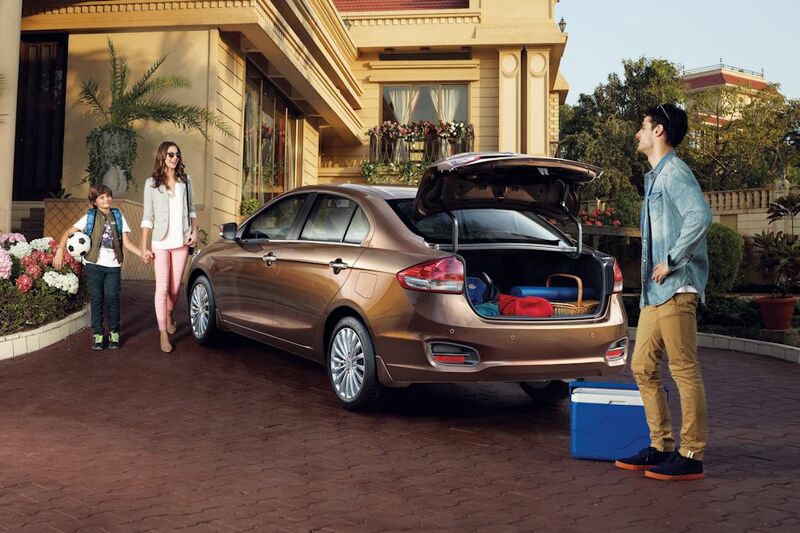 All Ciaz models are powered by Suzuki’s reliable and low-maintenance K14B 1.4-liter 4-cylinder engine. Equipped with VVT (variable valve timing), it generates up to 92 horsepower at 6,000 rpm and 130 Nm of torque at 4,000 rpm. Depending on the variant, this engine can be mated to either a 5-speed manual or 4-speed automatic. More than just providing spritely performance, the Ciaz features refinements in powertrain and suspension components ensuring a quieter cabin and smoother ride. 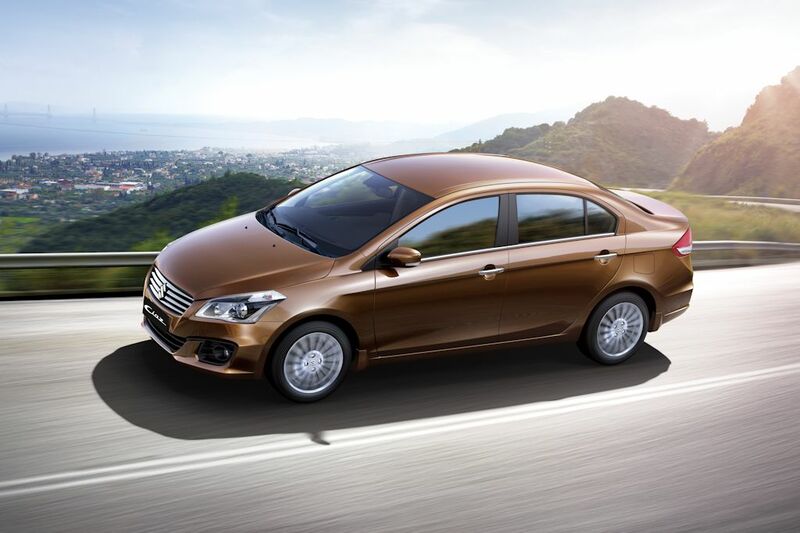 Built on Suzuki’s Total Effective Control Technology (TECT), the Ciaz boasts of the usage of high-tensile steel. Apart from the strong, but lightweight body (curb weight is 1,010-1,040 kilograms), the long wheelbase offers stability especially through corners. 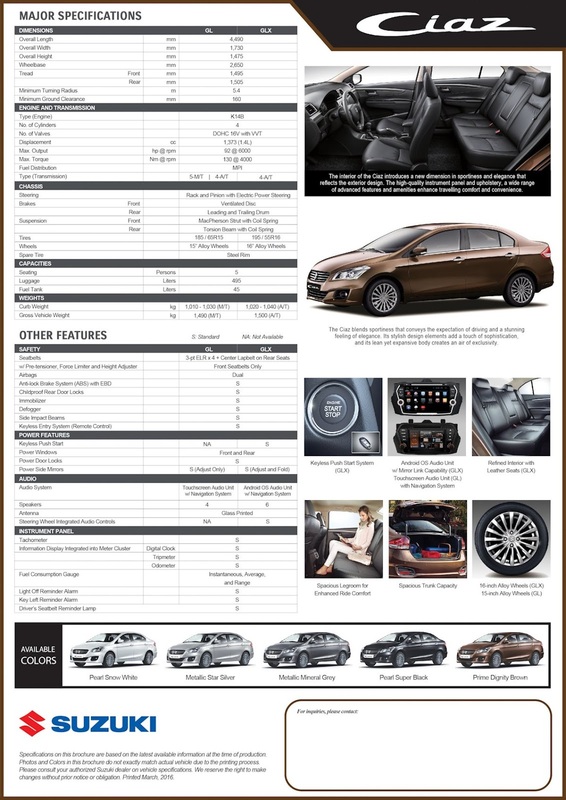 It’s also equipped with dual SRS airbags and ABS with EBD on all variants. The all-new Suzuki Ciaz is available in five colors: Pearl Snow White, Metallic Star Silver, Metallic Mineral Grey, Pearl Super Black, and Prime Dignity Brown with a suggested retail price of P 738,000 (GL M/T), P 773,000 (GL A/T), and P 888,000 (GLX A/T). 880k? Good luck competing with the honda city. How? With the 4 speed automatic and 1.4L engine? Yeah right. We'll see about that. This seems like a good car but at 880k, I'd spend a little more and get the city. Ciaz is much better than City. Kalampagin ang Honda that's why ayaw nilang gawing taxi dahil hindi siya oobra. I agree Ciaz is much better for now. wat about the service during warranty period? Some dealer is asking for money and charged u Like mitsubishi calamba..be aware of this dealer..most of the mechanic are not qualified..
Pareha lang sila ng toyota at hyundai. Im planning to buy Accent AT but somebody is offering Suzuki Ciaz, any recommendations? Pwede na yung ciaz. Both seem to have crappy 4 speed automatic however the ciaz is newer. 2016? and is not yet Apple carplay? Do you guys think its good to be used as an UBER car? The Ciaz here are made from Thailand. City in my opinion. More hp and torque plus City's top of the line has 6 airbags. Hello there. 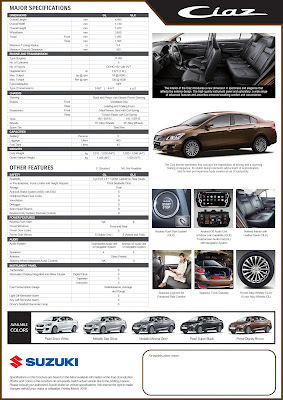 I am thinking of buying this car-Suzuki Ciaz; as my wife really love its elegant look. It seemed not so bad on their price yet wondering how is its performance and its after-sales service? Up for their after sales services. How was it? Planning to get one on suzuki shaw. The ciaz is a good car but the after sales service is poor.. hope top management can improve on that because it put to waste the minds who created the car only because of poor customer service after sales as to customer satisfaction. Anyone else here has their own experience of poor after sale service in suzuki? The ciaz is good but the after sales service is poor.. hope top management improves on that. It takes away the beauty of the car just because of bad customer service as to customer satisfaction. Hmm. Im also onto after sales and service. Never got wrong with toyota. But ciaz is way more better for me in terms of its features. Im just worried of suzuki's after sales and services. I mean, how was it really? I tried test driving both Ciaz and Accent AT in one day and found out that Ciaz has many to offer than Accent. Kung pareho lang magiging monthly payment ko of 14k better to go with Ciaz. Parang Elantra ang katapat ng Ciaz sa laki ng body at hindi Accent. And the ride comfort is very good. Shifting is responsive, hindi matagtag like accent. Malaki legroom, at malaki cargo space. I like more of ciaz, napaka fuel efficient. 27.9kmph kung malayo ang byahe mo, 22kpmh nqman kung bara ka sa city..even the lowest variant has a built in GPS. the accent eats diesel, while ciaz naman gas and the former is just about a shade better in KPL, sabi nung salesman. yung ciaz ang laki ng leg room and better looking but im not so sure about the after sales service annd availability of the spare parts.hay naku! naguguluhan na ako. ive never bought a car before balik na lang kaya ako sa jeepney? pls help!! This is by far something I can relate to here. :) Checking options between Ciaz and Elantra. --- but yeah, I'm not driving too. I have been doing my homework for about a month now looking for a sedan, and by far, Ciaz is consistently showed up ahead from the competitors. Check this YouTube link for your consumption. This might help on your decision making. This is just one of the few links I searched. There are actually more and Ciaz mostly top them all. Anu mas ok ciazGL or viosE?? Pag dating sa gas ? 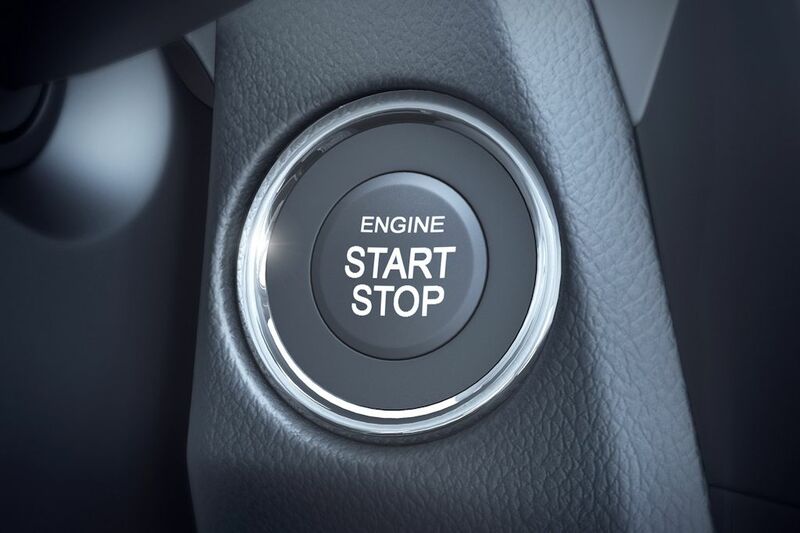 Toyota and Honda are 2 icons that are able to define standards in Automotive manufacturing. 2nd tier challengers like Hyundai, Nissan, Ford, Kia and yes, Suzuki are continuously building intriguing products to survive competition. But although, Toyota and Honda are still leading mass produced vehicles, that gap has been narrower than it was 5-10 years ago. 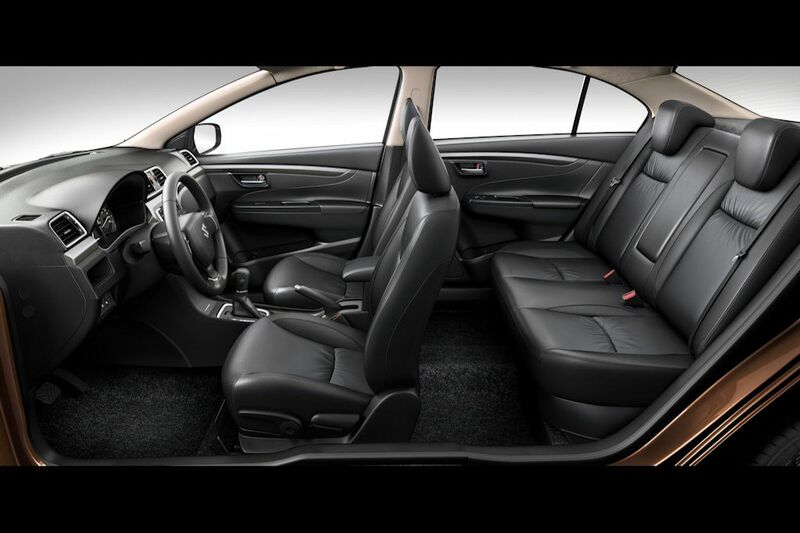 Suzuki Ciaz-GLX 2017 gives you more bang for your buck. It offers high-end features only available to high-end trims offered by competitors. 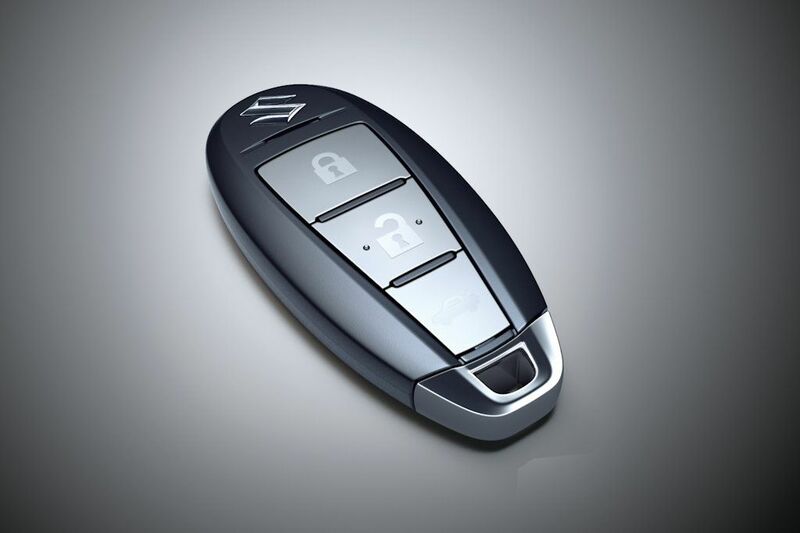 Leather seats/steering, Navigation, Key-less-smart key, start button and big-size-wheels. But wait there's more, decent leg room for seats behind. My personal estimate, you are able to save 100K atleast by not buying Toyota/Honda logo. I drove a Ciaz to Tanay and Daraitan, the good handling and brakes responses keeps me feeling safe even when turning on curves at high speed downhill. Only, not as robust as Vios when climbing uphill but will centainly beat the City. I spent 500.00 on gas, from Diliman to Daraitan and back. No rush on uphill climb..